One of the iOS 7’s most promising improvements is enhanced support for system’s Bluetooth Low Energy (BLE) in the shape of a new profile, which Apple refers to as iBeacon. Apple quietly announced the new technology at WWDC back in June, though it didn’t provide much details about it. 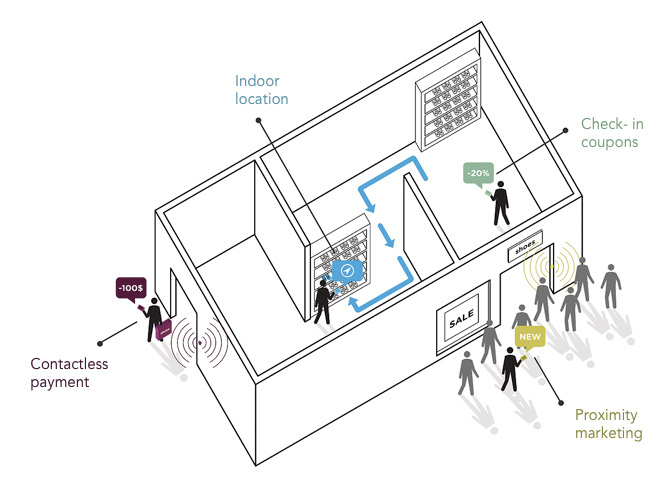 However, GigaOM notes that once iOS 7 goes public next week, retailers and other large indoor spaces will be using iBeacon to send data over short distances to iPhones, a technology that might eventually kill NFC. The article details that by using BLE, iBeacon opens up a new whole dimension by creating a beacon around regions so your app can be alerted when users enter them. Beacons themselves are basically small wireless sensors placed inside any physical space to transmit data to your iPhone using BLE, which is more commonly known as Bluetooth 4.0. The article also claims that the technology may be used to provide micro-location services like indoor mapping, serving everything from coupons to hard-coded GPS coordinates to any interested devices in the area. As to why iBeacon technology might be an NFC killer? Well that is because of its long range. NFC tags are required on each product because NFC works only in very close proximity (20cm). Also, mobile devices need to contain a NFC chip that can handle any NFC communications. On the other hand, iBeacons range is up to 50 meters. Not all phones have NFC chips, but almost all have Bluetooth capability. It must be noted that iOS devices aren’t the only ones to support BLE. The majority of smartphones on the market today implement the specification, though products and services that take advantage of it are still in early development. However, both PayPal and Estimote have announced that they’re hoping to release their products as early as next year.